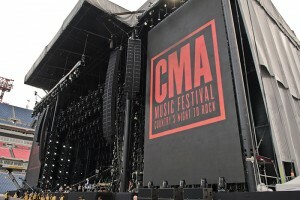 The 42nd annual CMA Music Festival, the world's largest country music festival and broadcast, recently stomped all previous attendance records at its 2013 event, which took place in Nashville from Thursday, June 6 through Sunday, June 9. 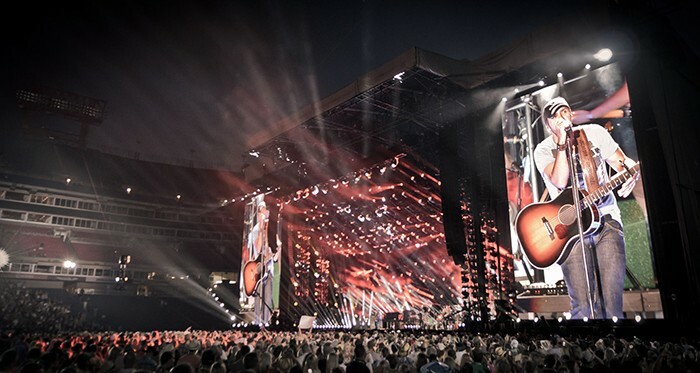 As usual, the highlights of the festivities this year were the main stage concerts at LP Field, which nightly drew more than 45,000 spectators to cheer and sing along with dozens of the genre's top artists. For sound reinforcement duties, the Country Music Association (CMA) awarded the contract to Sound Image, which supplied a large-scale L-Acoustics K1 system for the headlining concert each night--all four of which sold out more than six weeks in advance. Project Manager Curt Jenkins and his crew deployed a system comprised of 72 K1, 12 KARA and 16 KUDO line source elements, 16 K1-SB and 32 SB28 low frequency enclosures, and 78 LA8 amplified controllers. Also currently on tour with K1 systems from Sound Image are Kid Rock and Tom Petty & The Heartbreakers. LP Field's two primary loudspeaker arrays consisted of six K1-SB and 16 K1 with three KARA downfills below, flanked by angled side hangs each featuring two K1-SB, 12 K1 and three KARA. Two six-KUDO auxiliary arrays covered the extreme left and right upper stadium seats, while two delay hangs near the back end of the field were both comprised of eight K1. Jenkins, who is perhaps best known as Lady Antebellum's production manager, is quick to point out that Sound Image Engineers Roz Jones and Rich Davis, along with the onsite assistance of L-Acoustics Touring Application Engineer David Brooks, were instrumental in the deployment and tuning of the system. "Huge outdoor stadiums like LP Field are always particularly challenging for concert sound reinforcement because not only do you have to cover a huge number of seats, but you also have to deal with sound coming from a variety of different places--mains, aux hangs, far side hangs, delays and so on," says Jenkins. "But I have to say that once we lined everything up with Dave Brooks' assistance, the transition between all of the different arrays was so incredibly smooth--way smoother than I had even anticipated. While we were tuning the system, I was overwhelmed by how much it felt like I was listening to this giant stadium rig as if it were a set of high-end studio reference monitors with a whole lot of horsepower. The coherency and tonal balance was really amazing. "We brought in Jason Glass of Clean Wireless Audio in Nashville to coordinate all of our wireless mics, radios and other similar devices, and everyone was impressed by how well the RF stood up in front of the PA. There was a tiny secondary stage approximately 100 feet out front, which could have been a real nightmare, but we were just floored by how much headroom we got on the mics out there because of K1's precision. It was just unreal!" 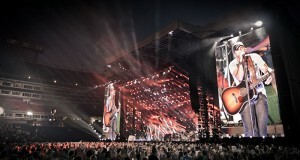 CMA senior director of live events and special projects Chris Crawford and Production Director Brian Leedham, known for his longtime service with Reba McEntire, oversaw the production as a whole--and both of them were extremely pleased with the results. "Sound Image truly exceeded expectations on everything from their crew to the PA," notes Crawford. "A huge thanks to them for helping us continue to improve the fan experience." Compliments were equally glowing from FOH engineers that had the opportunity to mix their respective artists on Sound Image's system. "For me, the L-Acoustics K1 never disappoints," says Brent Sparks, FOH engineer for Eric Church. "It's musical and powerful with a time-phase accuracy that is scary good!" Brett "Scoop" Blanden, FOH engineer for Lady Antebellum, agrees. "I was really pleased to have the K1 this year at Nashville's CMA Fest. This was a perfect PA for a stadium festival of this size. The coverage was even everywhere I listened around the venue and the onsite technical expertise from Dave Brooks and Sound Image was welcomed and informative. Overall, there was a noted level of audio excellence at this festival compared to years past." Jenkins notes that the general feeling from engineers coming though was complete satisfaction with the system. "With many other stadium rigs, you often find that you have to change your mix so much to make things sound somewhat normal," he says. "But with the way that Dave, Roz and Rich set this one up, it played to the engineer and sounded 'right' from the very start without requiring any significant tweaking. The comment that I kept hearing over and over was that K1 finally made it fun to mix this festival again."